As I’m sure many baseball fans have heard, the MLB will be looking to suspend a number of major league players in connection with the Biogenesis lab in Florida ran by Tony Bosch. A number of MLB players including Ryan Braun and Alex Rodriguez were on a list of notable players that could be facing suspensions. 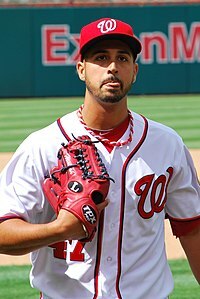 Unfortunately, Washington Nationals ace Gio Gonzalez was also placed on a list of players that received substances from that lab. The good news, however, is that nobody expects Gio Gonzalez to receive any sort of disciplinary action since all reports have said that Gio only received legal substances from Bosch’s clinic. While, according to notes from the clinic, Gonzalez did receive substances, Gonzalez as well as others maintain that the substances listed in those notes do not fall into the illegal substance category of the MLB’s drug policy. According to the Washington Post, Gonzalez actually insists the drugs were for his father. While there are 20 players listed on the Biogenesis lab distribution list, Gonzalez is the only that is expected to be exonerated. Gio’s case will likely be examined and scrutinized just like that of Rodriguez and Braun, but many experts anticipate that Gonzalez’s investigation will come up clean and no suspension will be handed to down to him. In a related note, Gonzalez has never failed a drug test and when these allegations came out in February, there were two unnamed sources that told ESPN Gio’s substances were legal. Aside from Gonzalez, should Rodriguez be found guilty for taking banned substances, this would be catastrophic for his career. Essentially, as Tim Kurkjian put, he would become the Lance Armstrong of Major League Baseball. A-Rod has always maintained his innocence when it comes to performance enhancing drugs and this would all but shatter his MLB Hall of Fame hopes, which may have already been dashed just by his recent PEDs past. For Ryan Braun, he has adamantly maintained his innocence in this report, as well. He has fielded multiple questions multiple times and has always maintained that he has never used performance enhancing drugs. While Braun did fail a drug test last year, that test has been highly questions as to whether or not it was administered or handled properly. There’s a dark day looming for Major League Baseball. The steroid era is starting to come a climatic moment where a number of notable players could be sent packing for upwards of 100 games should they be found guilty of using PEDs. This entry was posted in MLB, Nationals and tagged Alex Rodriguez, baseball, Biogenesis, ESPN, Gio Gonzalez, Gonzalez, Major League Baseball, MLB, performance enhancing drugs, Ryan Braun, Steroids, Washington Nationals. Bookmark the permalink.